Evidence | Why Dont You Blog? Sorry, I had planned to stop going on about the comments on the Jamie Whyte article. However, on further reading there were some comments I couldn’t pass up on. Erm yes. Being an atheist means you do not believe. It is kind of in the definition of the term. Being an atheist does not mean you “believe” in a hedonistic lifestyle of death and destruction (strikes me as being a bit too biblical to be honest). It does not mean you have be debauched and craven to fulfil your belief structure (again, this seems a bit like a few churches….). It simply means you do not believe in any gods. Easy isn’t it? You were one of my philosophy lecturers when I was at Cambridge in the 90s. 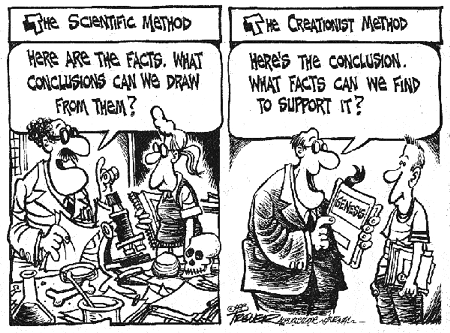 I reject your ‘realist’ view of science. Science doesn’t explain the origins of anything, it’s merely a useful construction to help us form judgements about the future. This view lets religion and science coexist. Is this a bad thing? Not really. It is an honest answer. At best “Religion” can take it a stage further with “[deity of choice] caused it to happen” but still the question remains – who created the deity? Dishonest Religion weasels back with words to the effect of the “Uncreated Creator” but it is a screaming logical fallacy. This view lets religion and science coexist. How? While in an ideal world, and for some people, their particular religion and science can co-exist, as a general term it is impossible. Science demands its practitioners accept the evidence presented before them and dismiss even the most cherished notion should the evidence demand it. Religion is the exact opposite. It demands its practitioners cling to their notions in the face of evidence, no matter how strong. In light of this, how can the two co-exist? One must always be corrupted by the other. If my religion dictated that the Earth was flat, could that co-exist with Science? No. Either I allow the evidence to alter my religion (either changing the interpretation of its canons or simply pretending parts of its holy book don’t exist) or I refute the evidence because my faith is strong. That is not co-existing, one or the other must triumph. Personally I thought the enlightenment was when Science had taken the lead, but it seems a large portion of the world is trying to drag itself back to the middle ages. Over the last few months, I have ranted a few times about how I think that civil liberties in the UK (and to an extent the world over, but I don’t have first hand experience of that) are being eroded as a result of general fear and the media’s incessant pressure to convince people we live in dangerous times. I also rant about this quite a bit in the real world where, the same as online, I am often faced with arguments which basically say there is nothing to worry about, the security forces are trustworthy and only guilty people need to have anything to hide. These arguments are basically false but it can be difficult to refute them, examples like the Guildford Four or Birmingham Six are distant memories now. Recently, the latest spate of inept terrorists appear to have provided the impetus for the Home Secretary to be looking at reforms to the UK’s anti-terrorist related laws. As well as on this blog, even sites such as the Register have demonstrated some concern in both the driving force, and the results of this new fear-based-law society. I have spoken in the past about the problems of detaining an innocent person for two months without even having enough evidence to charge them, and this remains (in my mind at least) still the critical issue over the whole deal. Taking someones life away from them, putting them in a cell and controlling their life is a punishment. Despite what the tabloids may try to make people think, it is not an easy time nor is it a “holiday” camp. Given that most UK prisoners are Christians (interesting considering…) someone detained as a suspected Islamic terrorist is at much greater risk of mistreatment by fellows inmates if they are detained with the general population, or they end up being put in solitary confinement for their own protection. Either way it amounts to a serious punishment that would normally require you were convicted of a criminal offence first (and a reasonably serious one to amount to two months detention). It would be nice if we could be sure that the police forces across the UK would only enact this legislation on the most solid intelligence possible, and this is certainly what is claimed by the ministers and officials pushing for it. The problem is, this really is not the case. The police have no public accountability (for reasons I agree with) over their intelligence and neither the police nor the security forces are subject to any form of censure should they get it wrong. There is no real incentive for the police to adhere to this high standard — in fact, given the way figures are presented with the totals being more important then the amounts presented for trial, it seems the opposite is true. A recent example of this has been bouncing through the news since the London/Glasgow terrorist event. One of the key suspects was an Indian born Doctor who was arrested in Australia based on UK police information. Dr Haneef has been identified repeatedly in the tabloids as a terrorist (suspect with lesser emphasis) over the past few weeks and the police were doing their utmost to have him sent back over here (in an ironic reverse deportation) so he could be detained under anti-terror legislation — this would have meant the police could detain him for 28 days under current laws, before having to bring charges. So that the Australians would co-operate and deport Dr Haneef, the police shared a fair bit of their intelligence with them and this is a good thing. I am not pro-terrorist. As a result of this, the Australians detained Dr Haneef for several weeks and tried to bring a case against him. Prosecutors had claimed that the doctor’s mobile phone SIM card had been found in the burning car that crashed into Glasgow international airport on 30 June. But it later emerged the card had actually been found in a flat in Liverpool, some 300km (185 miles) from Glasgow, where his second cousin lived. Australia’s most senior police officer, Commissioner Mick Keelty, said UK police had provided the inaccurate information. “Haneef attempted to leave the country. If we had let him go, we would have been accused of letting a terrorist escape our shores,” he said. The charges against Dr Haneef were dropped after Australia’s chief prosecutor said there had been mistakes made in the investigation, and because of a lack of evidence. (read more on the BBCs article titled “Why the Haneef case disintegrated“) Sadly, it is probable that we only know of this because the case was handled by a foreign police force. If Dr Haneef had been detained in the UK, he could have been held for 28 days before any case was even made and if it collapsed in that time, there would be no public information as to what went wrong. Basically, Dr Haneef would have spent a month in jail because the police thought his SIM card was somewhere it wasn’t. Most of the current vitriol against the police over this case is aimed at the Australian police, but does anyone think the UK (or pretty much any other western nation) police are all that different? I have said before that the main reason there is so much apathy over this is that it seems to target minorities, and that alone is a sign that we should all be concerned about the steady erosion of basic civil liberties. While, for now, it may seem like only the brown skinned ones with beards, funny accents and unpronounceable names are being singled out, once the right has been legally removed it is gone for everyone — Hindu, Atheist, Moslem, Jain or Christian alike (and it brings to mind Pastor Martin NiemÃ¶ller‘s famous poem). In today’s Guardian newspaper (and online and here) there is an article explaining how the fears and worries of the “electrosensitive” woo-mongers is unfounded. Which pretty much captures the repetitiveness of this as a research result. The overwhelming weight of science shows there is no evidence of any short term harmful effect from communications masts and the only proven long term risk is from the most popular source of electromagnetic energy itself – the Sun. What sufferers experience is real and in many cases very unpleasant. But in the light of this evidence we can be pretty certain that phone masts do not cause short term health problems for the vast majority of people. Electrosensitive support groups should recognise this and begin to look harder for other causes of the condition. Well said. Stop fighting a bogeyman and find the real cause – if there are real symptoms. As always, there are those who are so wedded to a concept that no matter how much evidence to the contrary is presented, they will refuse to accept it. Sounds a bit religious to me, but never mind. The wonderfully named “Mast Sanity” website is a cited opponent of the recent study, and shows many of the traits you would normally associate with creationists trying to debunk evolution. We question why psychologrists are doing this research at all since physical changes to the skin and heart rates have been found in other research. Presumably the psychologists ‘believe’ this is all in the mind and this is what they set out to ‘prove’. Yeah, and when you read the research notes it shows the psychologists set out to measure the physical responses. This smacks of a combination of appeal to ridicule and the laypersons perception that educational disciplines exist in complete isolation of each other. If the researchers had set out to prove the Electrosensitivity was in the mind, this would be obvious from the experimental design, not from what discipline the people who run the experiment come from. Their conclusion was made possible by eliminating 12 of the most sensitive electrosentive volunteers who had become too ill to continue the study. Even a child can see that by eliminating 12 of the original 56 electrosensitive volunteers – over 20% of the group – that the study integrity has been completely breached. Wow. First off the 12 people withdrew themselves, they were not eliminated to make the experiment possible. If the other 44 “electrosensitives” were actually electro sensitive, then what would the loss of those 12 change? As for the great “even a child” comment — well really. I have not met many children who can do the statistical analysis required to account for the changed sample sizes, but most would probably make a random assumption as to the status of the experiment. Does that mean they would be correct? Critically, the “study integrity” has certainly not been completely breached, it just gives a larger error bar to the findings. … We don’t think Dr. Rubin [author of previous study] is qualified to comment on the Essex study as he didn’t even use a shielded room for his own experiments at King’s College and the so called ‘sham’ (zero) exposure was not a zero signal as people have been led to believe. What makes me laugh about this, is the “pro-sensitives” leap on the shielding issue, and largely it is a cornerstone of their defence against the real science. In a nutshell, it explains why the “sensitives” report effects when no mast is transmitting, but they are led to believe it is. The problem with this is that when the “sensitives” believe the mast is off, they report no symptoms. Is the shielding belief-powered? Great isn’t it? They refer to themselves in the third person and claim the science is spin and their spin is science. New Labour must love the world they have created. The study was solid science. It certainly was not a perfect experiment, but few ever are. The conclusions drawn are sound and the reasoning is valid. The Woo-Monger reactions have been an exercise in spin and bad-logic, rarely coming close enough to science to be thought of as bad science. The study was very upfront — as have been the media reports — that this didn’t look at long term effects. Sadly, spinning the goal posts to a new location does not invalidate the research — not that the woo crowd have ever worried about that. Asking if there are long term health effects is a good question, and an area where the research is sketchier which results in less certainty over the answers. That said, the common cries of the “electrosensitives” is that they suffer short term effects (which is why people buy “shielded curtains” and the like) and on this, it is quite probable that they are wrong. Redefining the criteria each time one is falsified is typical of another group who hold to nonsensical beliefs in the face of all evidence. Will Electrosensitivity become the Woo of the Gaps? There is one article, in the Comment and Analysis, which I am unsure about. Reading it, triggers a “bad science” response in me, but I am aware this may be a bit hasty. In an article titled “The media make a killing,” Michael Bond looks at some of the issues around the coverage of the Virginia Tech shooting. This is a well written article, which carries a lot of the “self evident truths” which the print media seem to like. As I was reading it, though, a few alarm bells were triggered — but this is not a subject in which I am well versed so before I scream Bad Science, I would like second opinions. Well there is a rant brewing, but sadly here in the Ivory Why Dont You Towers we are short on spare time so I can not do justice to a video posted by what seems to be the single most objectionable person I have ever had the misfortune to see. PZ Myers has posted on Pharyngula about it and pretty much says everything which needs to be said. Check it out for the full details. In a nutshell, this snotty, arrogant kid called Kelly Tripplehorn (snope entry for background) has posted a video in which he claims his “corporation” will offer US$1000 to anyone who can solve the philosophical problem of Induction. Yeah, that is correct. $1000. Wow. Alfred Nobel, eat your heart out. Barely enough to buy a low end laptop to solve one of the major philosophical problems. To crown things off, the nutcase Tripplehorn goes on about how “he” solves the problem by invoking God. What absolute madness. He demands a reasonable, self consistent, internally logical argument from Atheists but not his own reasoning. I would like to go on record, having noted his only requirement is “without invoking God” to say the problem is solved, and the universe is logical and ordered because it is the will of Freya. She is neither the Abrahamic God Tripplehorn talks about, nor a generic “God” (as she is a Goddess…). Evolution – Humour or Crank? Once more, the Great Tuatatis has guided me to some more erratic websites (I suspect I actually found it as a link on someone else’s blog, but unfortunately I cant remember who to tip my hat to, sorry). I was reading the write up on the various Times Online sites of the “Intelligence Squared” event which tool place recently. Basically this was a debate on the motion “We’d be better off without religion.” On the side For the motion were Richard Dawkins, AC Grayling and Christopher Hitchens. On the side Against the motion were Julia Neuberger, Roger Scruton and Nigel Spivey. Ruth Gledhill, the Times’ Religion reporter, has written an interesting summary of the proceedings titled “Articles of Faith.” Gledhill describes herself as someone who is sure God exists, yet there is not much in the way of a pro-theist bias in the reporting. All in all, it struck me as a reasonable post (not least because she says the “For” argument was better than the “Against” one 🙂 ). Well I’d be upset if my son became a creationist but there is no chance of that, not in the Church of England at least. Which, while reasonable, is a risky proposition to take. Creationism / ID is a fundamental part of the monotheistic doctrines, so while [insert religion] may not overtly push it, it is there below the surface. I would love to see a Christian doctrine which does not assert the universe was created by God, and that man was not made in his image. Although I may be biased, I find it hard to see how some can reconcile this belief with anything else. [Dawkins] problem is that he takes religion too literally, and as many have pointed out, is too fundamentalist about his own atheistic creed. Wow. All over the net, on TV, the radio and in papers people try to defend religion, and deflect criticism, by saying the critic is taking religion “too literally.” Personally I am at a loss for any other way to do it. Either God exists or he doesn’t. I assume Christians (and Jews/Muslims) believe God exists – is that taking religion too literally? Religion is built around doctrine and “rules” which are claimed to be the word of God. If the faithful get to pick and choose which ones they follow, doesn’t that make a mockery of that which is already comical? If the best defence for “religion” is that it is something which gives people the chance to get together with each other and has some vague good ideas (don’t want to take the doctrine literally, do we?) then it strikes me it really is an idea which has passed its sell by date. If religion is not meant to be taken seriously, what is it? I agree with Richard Dawkins, we WOULD be better off without religion. Not sure if that was supposed to be a joke or what. Still, at least Dawkins is consistent with Darwin himself. There are more, but I could end up spending all month writing about them so I will stop now. Have a look, see what you think and if there are any more howlers please let me know. Previously I made a post which examined the logic (or lack thereof) in a post made on parabiodox. Today I see there has been a follow up post that addresses some of the “issues” I made, so I think it is only fair that I (in turn) address some of the new comments. This is a very readable, calm and intelligent response to a rather bombastic blog entry from me. Of course the only reason I wrote it was I was hoping that someone would come along and write the kind of response that Why Dont You Blog? has provided. Myself I do indulge in a bit of calm and measured article writing once in a while, but what’s wrong with a bit of mud-slinging as well ? Variety is the spice of life I think. I couldn’t agree with the sentiment here more. There is nothing wrong with a bit of mud-slinging and, to me, the reason people blog is to get issues of their chest. At least this way no one gets hurt (unless they are very thin skinned..). Blogs would be boring places indeed if people did not rant, rave and froth every now and then. Talking of mud-slinging I did detect a bit of it in the article Theistic Logic, the implication being that this is the way all theists think, of course as I know only too well it definately isn’t. The blog entry was parabiodox thinking, and there’s only one member of that particular philosophy to date. While that is reassuring, ( 🙂 ) it is not completely accurate. IMHO most blog posts only speak for the line of thought adopted by the person who made the post, however this is a line of thought which is echoed across dozens of blogs (and is often found in the comments section on atheist blogs). While parabiodox does indeed seem to follow a unique philosophy, the fallacies in this particular post are reasonably common. Also shared with the Atheist faith of course, if you accept the author’s premise. But of course there’s a lot more evidence for the existence of Jesus than there is for the non-existence of God. Now, for so little words there is so much “illogic.” Starting with the first sentence: There is no such thing as the “Atheist faith.” It is meaningless. Any argument surrounding such comments is crying out to be accused of woo. The second sentence is interesting – mainly in the way it is constructed. I actually know people called Jesus so I agree there is a lot of evidence that Jesus exists. If we are talking about a Jewish carpenter, 2000 years ago then I am also happy to accept that Jesus existed. The important issue is: Was this Jesus the Son of God (while being God at the same time)? Now here the evidence retreats to the land of woo. What “evidence” is there that this Jesus is the son of God? In addition to this, the argument uses a fairly blatant form of fallacy (False Dilemma). It tries to present the existence of Jesus and the non-existence of God as the two opposing sides with the implication that proving the existence of Jesus falsifies claims of the non-existence of God. This is nonsense.